Sounds good. I liked The Martian, so maybe on your recommendation, I 'll give this one a try. Great timing on this review with the super moon so fascinating us all! This does sound good! I used to read a lot of sci fi, but have somehow moved away from it. I'm not sure why! Anyway, one of my faves: The Gate to Women's Country by Sherri S. Tepper. I think I'll give Artemis a whirl. Thank you for reviewing! Deported to Earth! I love that as a threat. It sounds like an entertaining novel. I grew up reading some sci fi since my brother loved it. I tend to prefer the books with good science so I should read something by this author. 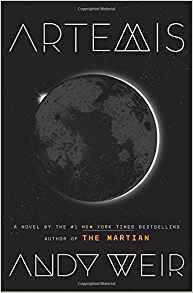 Did you prefer Artemis or The Martian? We had too cold temperatures for moon watching! It's funny, you're such a skilled, practical, living off the land person, it never struck me that you'd like a sci-fi!!! This sounds good. I haven't read much science fiction lately. I like Catherine Asaro's books. I have the kindle that is backlit also - love love love it - I have a new kindle fire but it isn't as easy to read from so I go back to my old, old kindle. I haven't gotten much into science fiction - my favorite kind of books are biography and autobiography - the latter my very favorite. Right now I'm reading one of your recently suggested books.